(CNN) -- Andrea Dovizioso claimed his first top-level race victory during an incident-packed British MotoGP which saw motorcyling's top riders struggle in the wet at Donington on Sunday. Andrea Dovioso claimed his first race victory in only his second season of competing in MotoGP. The 23-year-old Italian came home 1.360 seconds ahead of American veteran Colin Edwards after championship leader Valentino Rossi and his Fiat Yamaha teammate Jorge Lorenzo both slipped off the slippery circuit. Pole-sitter Rossi came off his bike when leading with 11 of the 30 laps to go, but was able to keep it running and resume the race. The Italian dropped back to 11th place but stormed through the field to finish fifth and extend his lead to 25 points. Rossi's nearest title rival Lorenzo had a more spectacular fall after appearing to go too wide at a corner and slipping on the white line and skidding on his back across the track, ending his race. 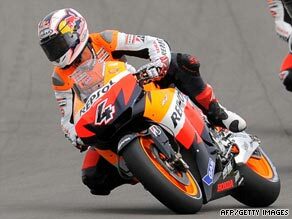 Australia's Casey Stoner, who is third overall, continued his difficult season as he finished way back in 14th, just ahead of another former world champion in Nicky Hayden. The Ducati teammates were more than a lap behind Dovizioso after making the mistake of going with full wet tires from the start of the race despite a lack of heavy rainfall. Frenchman Randy de Puniet took third place for LCR Honda as both he and Edwards finished on the podium for the first time this season, while Alex de Angelis placed fourth for San Carlo Honda Gresini. Rossi had a thrilling late duel with home hope James Toseland, eventually finishing less than a second ahead of Edwards' Monster Yamaha Tech 3 teammate. Marco Melandri was seventh for Hayate Racing ahead of Pramac's Niccolo Canepa, while Dani Pedrosa remained in fourth place overall after finishing ninth despite starting second on the grid. Edwards revealed that he was just glad to finish the race, which was the last MotoGP event to be held at Donington. "That was 48 minutes of hell. I wouldn't wish that race on my worst enemy," he said. "Every corner you didn't know if you were going to fall off or not as half the circuit was wet and half of it dry. I did not enjoy that at all. "But I have a new tactic for riding in the wet. I now use a dark visor so you can't see where the wet patches are, as everyone rides faster when they can't see where they're going."